Can you recommend a good, quick game? We like Monopoly, but it takes too long. We want something that’s easy to learn and play that also has strategy and variety. Dominion, which often takes less than 30 minutes to play, fits my sister’s criteria well. If I were to recommend a family collection of fewer than 10 board or card games to own, this would be one of them. It would be my top pick for very busy households. If you think new game strategy discussion is like a new movie spoiler, then skip the strategy sections. Some people who try this game wonder after a few plays if there’s more to this game than lucky card draws, so I decided a bit of strategy discussion was needed to do this game justice. I also happen to prefer reviews that include strategy discussion as it helps me determine if I’ll like the game. Games have been a major hobby for most of my life, so I’m aware of boardgamegeek.com, a great site by and for game enthusiasts such as myself. Though they have over 200 user reviews of Dominion, these reviews are primarily written by and for game enthusiasts. This review is for more typical families. Typical families own a deck of cards and a few games, but rarely more than 20 games. They typically don’t want games that take hours to learn, hours to play, or require frequent rule consultations. My experience leads me to believe that most families prefer games with strategy, variety, and some random elements. And of course, everyone wants to have fun. Dominion is a “deck building” card game with a medieval theme for 2-4 players. The manufacturer’s recommended age is 13+, but anyone who reads fluently can play. The goal of Dominion is to collect the largest number of points from Victory cards. The game ends when any three card piles run out or when the most valuable Victory card pile (Province) runs out. The winner is then determined by counting victory points. Play an Action: Each game starts with a different set of 10 Kingdom Cards available for purchase. Most Kingdom cards are Actions, though some are Victory or Treasure cards with special characteristics. One Action may be played at the beginning of the turn, though some Action cards permit play of additional Actions. An Action typically provides one or more additional cards, Actions, buys, coins, and/or something more complicated. “Attack” Action cards harm other players. An example is the Militia card—each other player discards down to 3 cards in hand. Buy a Card: Play Treasure cards. Count coins from Treasure and Action cards you played. For example, if you play 1 Market (an Action card that provides 1 coin), 1 Silver, and 3 Coppers, you get 1 + 2 + 3 = 6 coins. Purchase a card valued for that number of coins or less, and then place into the discard pile. Cleanup: Place cards that were played or are still in hand on top of your discard pile and draw a new hand of 5 cards. If you run out of cards, then shuffle your discard pile and turn it face down to become your new deck. The rules are very clearly explained in more detail in the booklets included with Dominion, which also include a sample game and recommended Kingdom sets. I can teach a new player the rules in 5-10 minutes. If nobody knows how to play, it takes approximately 15 minutes to read the rules and another 5-10 minutes to explain them. The rules booklet seems a little long, but much of it is explanatory pictures. Though Dominion is easy to learn and play, its strategy is difficult to master, due to the complexity introduced by playing with a different set of 10 Kingdom cards in each game. If your first few games of Dominion are with beginners, you may wonder if there’s much strategy to this game. Yes you can choose which cards to buy, but drawing them when you need them depends on luck, right? However, when an experienced player joins the table, it quickly becomes apparent that the experienced player almost always wins. Learn basic strategy for correctly timing purchases and improving decks to have a better chance of winning. If you enjoy figuring out new games without tips or aids you may want to skip this section, and you’ll definitely want to skip the next section on Advanced strategy. But if you’re reluctant to purchase Dominion because it strikes you as hardly more interesting than the card game Go Fish, read on to see what so many people find intriguing about this game. Buy Victory cards, most especially Provinces (6-point Victory cards). Beginners often buy exciting Action cards with both of their first two hands, but this is rarely good tactics. The starting deck of 10 cards has three Estates (worth 1 victory point each). The presence of Estates reduces the number of coins available per hand, while providing no benefit until after the game is over. The other 7 cards, the Coppers, are useful for early game buys, but as the game progresses they are usually more of a hindrance then a help. Hands with a few Coppers don’t generate enough coins to buy Provinces at the end of the game or expensive Action cards during the middle game. To acquire the more expensive cards, Silver and Gold are typically needed. Some Action cards do provide extra purchasing power by adding extra coins or drawing extra cards, so in some cases buying an Action card with each of the first two hands makes sense. Once you’ve acquired enough Silver, Gold, and/or Action cards which add to your purchasing power, you’ll want to turn your attention to the second part of the game, implementing a Kingdom card strategy to maximize your economic engine. This is the most complicated part of the game. Purchasing a hodgepodge of exciting Kingdom cards that don’t work well together with no game plan will typically lose to the simplest possible strategy: Big Money. Big Money is a strategy of skipping Kingdom cards to buy only Silver, Gold, and Provinces. Very simply: Buy a Province every turn you can. If you can’t buy a Province, buy a Gold. If you can’t buy a Province or a Gold, then buy a Silver. If you can’t buy any of these three, buy nothing. That’s it. Yes, it’s boring. However, against someone who has chosen a poor strategy, Big Money almost always wins. The Big Money strategy is even more effective with minor enhancements, such as buying a Duchy or two when the game is about to end, or buying a single Action card that allows you to draw extra cards, such as Smithy. Big Money is the benchmark by which other strategies are measured. If the strategy used for a given set of 10 Kingdom cards is not better than Big Money, then there’s no reason to use it. Figuring out the optimal strategy for a given set of 10 Kingdom cards is at the heart of what makes this an interesting and complex game, and is too complicated to be considered “basic strategy.” The next section on advanced strategy discusses a sample Kingdom card set and common Kingdom Card strategies. When first learning Dominion, it’s important to understand the implications of playing only one Action card each turn. Some Action cards say “+1 Action” on them, which means you can play an additional Action after playing this first Action card. Some cards even have +2 or +3 Actions printed on them, which means you’ll be able to play 2 or 3 additional Actions. However, cards which do not provide additional Action(s) are called “terminal” Actions, because they will be the last Action you play when you only have 1 Action left to play. At the beginning of your turn, you only have 1 Action, so if you have more than one Action card in hand, you generally won’t want to play the terminal Action card first. Avoid buying many terminal Actions unless you are also buying cards which provide +2 Actions. Once you’ve acquired enough Kingdom cards to fully implement your strategy, it’s time to buy Victory cards. For most strategies, it makes sense to buy a Province any time you can. However, the opportunity rarely presents itself until later in the game. When it’s clear that the game will soon be ending, then you want to forget about everything else and just buy Victory cards each turn. That is generally the only time you’ll want to buy Duchy or Estate cards. Don’t get so excited about Action cards and invested in your strategy that you ignore Victory cards. If you start purchasing your Victory cards too late in the game, you’ll lose no matter how many great Actions you’ve acquired. More advanced players learn to identify and choose a great strategy in a given Kingdom set, and then make good tactical decisions when implementing the chosen strategy. I’m not going to go into great depth in this section. I’m just going to mention a few common strategies that recur frequently, depending on the set of 10 Kingdom cards that comes up. Click on the above Kingdom set to launch a new tab with clear text overlay when you hover. Perhaps the most obvious strategy is to load up on some combination of Laboratories, Markets, Festivals, Council Rooms, and Throne Rooms. That’s what I used to do when I first started. Intuitively, stringing together many Actions that add coins, cards, and more Actions will build up a formidable economic engine, right? Once this engine gets going, it looks like it could buy one or sometimes even 2 Provinces per turn. It turns out that this isn’t too bad a strategy. However, this strategy is sensitive to the order in which these cards are purchased, and can take a long time to get going. In play testing this set with my family it rarely beats a strategy of buying a single Chapel card. With the first two hands, buy a Chapel and a Silver. This Chapel is the one and only Action card that will be purchased all game. When a Chapel is present in the hand, use it to trash all Coppers and Estates. If your third hand of the game is a Chapel, 3 Coppers, and 1 Estate, you must trash all 4 cards. If your third hand of the game is a Chapel, 1 Silver, and 3 Coppers, you must trash all 3 Coppers and buy nothing. The rest of the Chapel strategy is similar to the Big Money strategy. Whether or not Chapel is present, buy a Province every turn you can, and if you can’t then buy a Gold. If you can’t buy a Province or a Gold, buy a Silver. Never buy an Action card beyond the first Chapel, and never buy any other type of card besides Provinces, Golds, or Silvers. What you’ll see with this simple Chapel strategy is that after 6-9 turns, you’ll have no Coppers or Estates. You’ll have a single Chapel card, Silvers, Golds, and perhaps a Province or two. At this point you buy a Province every turn you can. A slight improvement over this strategy is to buy a Duchy or two at the end when there are only 1 or 2 remaining Province cards not yet purchased. One of the first things I look for when evaluating a set of Kingdom cards is whether there are any trashing cards such as Chapel. So what happened when my family of 3 tested this particular set of 10 Kingdom cards? For testing purposes, we only allowed one player to use the Chapel card in each game. We took turns. In the first 6 games, the rule was that the Chapel-card player could only purchase one Chapel and was not allowed to purchase any other card. However, this person was permitted to purchase Duchy and Estate cards and to trash Silvers. Following these rules, the Chapel player won 4 out of 6 games. Some of the Chapel player’s wins were very close, though. One Chapel player loss was due to the Chapel player not trashing Coppers at every opportunity. In the next 3 games, the Chapel player had to buy a Chapel within the first 2 turns, but otherwise had no restrictions. The Chapel player won 2 out of 3 times, and lost a close game due to a combination of bad luck and a couple of poor tactical decisions towards the end of the game. These last 3 games were shorter. In these last 3 games, the Chapel was merely a deck thinning tool to make way for the main strategy which came a little later. 2 out of 3 times, this main strategy was to simply obtain a few Laboratory Cards. Given that Laboratory provides +1 Action and +2 Cards, it increases the size of the hand without ever clogging it. This increases the chance of drawing 8 or more coins per hand. However, what was most interesting was to see that there were several viable strategies with this Kingdom set. One strategy that did almost as well as Chapel was to buy several Festivals and Council Rooms. This player accumulated Provinces before the Chapel player, but at a slower rate. This strategy did not win any games but lost several very close games. My 11-year-old son came up with an interesting and effective strategy that centered around the Gardens card, a Victory Kingdom card which states “Worth 1 Victory point for every 10 cards in your deck.” He lost badly the first time he tried it, but he won with his second attempt. My wife subsequently won a couple games with it as the Gardens strategy was gradually refined. The key to the Gardens strategy with this set was to notice that there were 4 Kingdom cards with extra buys: Festival, Council Room, Market, and Woodcutter. The idea is for one player to buy most of the Gardens, while using extra buys from any of these 4 cards to load up on zero-cost Copper cards when a better card couldn’t be afforded. A good game for the Gardens strategy typically ended with 50 or more cards in the deck, approximately half of which were Copper cards. Normally it’s difficult to accumulate 50 cards when competing against a quick deck thinning strategy, but the many extra buys did the trick. This particular set of Kingdom Cards was fun to play multiple times because it was unclear which strategy was best. Three different strategies seemed viable, and even after 9 games with this same set of cards, it was unclear which strategy was best. While the Chapel player won 6 of 9 games, the other strategies were more dependent on making complex tactical decisions correctly, such as which order to buy Action cards. These other strategies likely had some upside with better tactical play. The Chapel strategy was simpler to implement and therefore less prone to error. Note that Big Money was attempted as a strategy in 3 different games. It lost every time. Chapel was too fast, particularly when a Council Room was played occasionally by a third player (+4 cards, +1 buy: Each other player draws a card). The time to use Big Money is when you can’t figure out anything better to do with the Kingdom cards. It’s also useful against beginners to help them learn more about game strategy. The Deck Thinning strategy works best with Chapel and no Attack cards present. However, it can also work with less powerful removal cards. Of greater importance, Deck Thinning is useful as a supplement to another strategy, as most strategies benefit from removing Estates and Coppers. First thin the deck, then implement the main strategy. Alternate Victory Point Cards such as Gardens, Vineyard, and Silk Road provide an alternate path to victory. This approach often requires play that is the opposite of normal good strategy. For example, a thin deck is normally better than a deck with many cards. But quickly generating a very fat deck is the key to winning if you collect Gardens. This type of strategy works best when only one player implements it, in order to limit competition for the key Victory Kingdom card. A nice description of other Alternate Victory Point strategies makes it clear that the strategy will vary depending on the card and the Kingdom set. Stringing Together Actions is a strategy that works when there are several cards that provide additional cards and Actions. When Action cards such as Laboratory, Festival, and Smithy are played one after the other, it’s possible to play a large portion (or even the entirety) of the deck in a single turn, perhaps buying two Provinces. Repeating this several turns in a row will quickly bring the game to an end, likely with a winning score. Bridge (from Intrigue Set): If you can play 6 Bridges in one turn (by combining with cards that generate extra Actions such as Village and Festival or card duplication such as Throne Room and King’s Court), you may be able to buy 6 Provinces in one turn. Game over. Remodel/Workshop: You can use Workshop to get lots of Remodel cards into your deck, as well as other 4-cost cards. Then you can remodel 4-cost cards into Golds, and remodel Golds into Provinces. If the game is almost over and you know you’re winning, you can Remodel Provinces into Provinces to run out the Province pile before anyone catches up. Spy/Thief: While the Thief card is too unreliable to be effective by itself, obtaining many Spy Cards allows you to look through your opponents’ cards until you find a Gold to steal. Each turn your opponents get weaker while you get stronger. Many more combinations are possible, with new ones being discovered every day. The last strategy I’ll mention is to hurt your opponents’ decks and hands. Use Attack cards to add Coppers or Curses (worth -1 Victory Points) to their decks, or to reduce the size of their hands. If only one player does this, that player will usually win. In a game with attack cards you need to have a plan for how to respond to opponent attacks. You can buy attack cards yourself, or buy cards such as Moat that neutralize or weaken opponent attacks. I was purposely brief in this section as this is a review, not an attempt to turn readers of this article into expert Dominion players. The idea was to demonstrate the richness and complexity of this game. If you want to explore strategy in more depth, I recommend the Dominion Strategy site. You can get a sense of Dominion’s depth by reading a discussion of how to beat the Big Money strategy with the First Game Kingdom set. Variable starting conditions and ordering of cards makes each game unique, and gives less experienced players a chance to win. Can be enjoyed at a very simple level or with deep strategy, whichever is more appealing. For those who enjoy puzzles, what is the optimal strategy for the given Kingdom set? Is there more than one viable path to victory? This is the complex, strategic part of the game, appealing to those who appreciate being challenged. Dominion is fun to play for those who play poorly or lose by a lot, because it has many meaningful mini-goals and decisions that give everyone a sense of accomplishment. This is an attribute that matters a lot for a family with varied ages and gaming ability. Dominion has many decisions per game, which keeps everyone engaged. An average game takes less than 45 minutes to play for beginners, and less than 30 minutes for experienced players (though some Kingdom sets will make for a longer game). Few games with complex strategy and many decisions take so little time to play. There are many expansion sets with additional Kingdom cards. Expansions add variety and make for great family gifts. Not everyone likes Dominion. As discussed earlier, some common criticisms are off base, such as the game having little strategy or having one dominant strategy (Big Money) that wins too often. Another common off base criticism is the lack of interaction. Attack cards are very obviously interactive. More subtle interaction involves competition for the limited number of cards in each pile and choosing when to force the game to end. There’s a lot of setup, cleanup, and shuffling. A few minutes to setup, a few minutes to cleanup, and 10-30 shuffles seems like a lot for a 30 minute game. It’s quite telling that online games of Dominion take 10-15 minutes to play, because setup, shuffling, and cleanup are eliminated. This issue is somewhat mitigated when playing multiple games, as Treasure and Victory Cards can be left out. If you buy all the expansions, the game can cost altogether over $200. This makes it the second-most expensive game we own. However, the game is quite satisfying with just two or three sets. 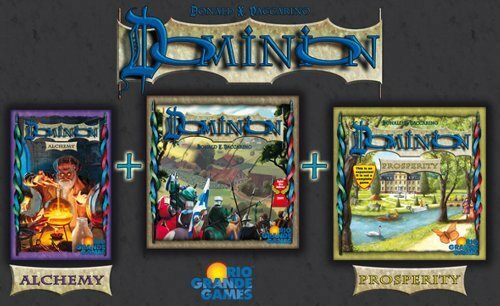 For families that enjoy Dominion, an expansion makes for a nice family gift. The theme is thin. A Village card gets you an extra card and an extra two Actions. This is supposed to remind me of a village? Treasures buy you Provinces and Duchies . . . I can sort of see that but honestly it doesn’t make me feel immersed in medieval times. Dominion is an abstract game with graphics and labels pasted on. The game can bog down sometimes when one player has very long turns with many Actions. For a typical family, the rules are a little long, and the first few games can be a little confusing as players familiarize themselves with the Kingdom Cards. It helps if one person already knows the game. And that’s about it for reasonable criticisms. Not too bad considering all the great things Dominion has going for it. Most people like Dominion the first time they play it, but I didn’t, because of how my experienced friend introduced me to it. We played several games of Dominion that day. Each time, he put out a completely different set of Kingdom cards from many different sets. Just when I began to understand how one set of cards worked, I had to start all over again. With all the focus on learning, it was difficult to get any kind of handle on strategy or any kind of enjoyment out of the game. When first starting, I recommend focusing on the first set, Dominion, and using the recommended Kingdom sets listed at the end of the second booklet. First Game, Big Money, Interaction, Size Distortion, and Village Square are all thoughtful Kingdom sets which gradually introduce players to different flavors of how the game can go. Players who enjoy attacking and other forms of interaction are more likely to enjoy the game at first if they start with the Interaction set. Every new expansion has a few recommended Kingdom sets, and I’ve found them all to be good for introducing the new game flavors possible with the expansion. We’ve found that we generally don’t like to use more than three sets at a time. This slightly reduces setup and cleanup. Also, we enjoy playing with a concentration of similarly themed cards. This is especially true of the Alchemy set, which requires Potion Treasure cards to purchase some Actions. How do you randomize cards from just 3 sets? One way is to use the extra cards included in each set for this purpose. This method is inconvenient when playing with different sets each time. We prefer using a phone App to generate Kingdom sets. Our favorite iOS App is Randominion. In addition to selecting which sets to draw from, you can customize style of play (light or heavy on attacks, blacklisting certain cards, etc.). You can also save Kingdom sets you especially like so that you can play them again. For beginners, the choice is obvious: Start by playing games with the first and oldest set, Dominion. You can buy this individually, or as part of Dominion: Big Box. Technically, you must start with either Dominion or Intrigue as these are the two sets that include Treasure and Victory cards. Of the two, I recommend Dominion. We find the cards simpler to understand and more fun than those in Intrigue. As for expansions, Wikipedia has a complete list with details. Amazon is a great source of reviews of these 11 sets. That’s a lot of different sets! The base Dominion set includes 25 Kingdom cards, while the other sets have anywhere between 12 and 35 additional cards. Dominion does not require many expansions to be fun. However, in my opinion, the base game with 25 Kingdom cards can quickly get stale. Buying even one expansion provides enough variety to make the game much more interesting. I don’t have a specific set recommendation after the base Dominion game, as it will depend on whether you prefer more interaction, complexity, or new rules mechanics. My suggestion is to play at least 20 games with the base set or Big Box before considering expansions. Once you’ve played that many games, you’ll start to get a sense for what kinds of cards your family prefers. Then you can look up online which expansions would be the most fun for your family. All that being said, we all have our own preferences. I prefer Hinterlands and Prosperity for the added complexity. My son prefers Dark Ages, Prosperity, and Seaside, all of which provide possibilities for stringing together many actions. My wife prefers Dark Ages and Seaside, which introduce new mechanics. The more attack-heavy Intrigue or Alchemy sets are less appealing for us. All three of us like the base Dominion set, but other than testing for this article, it has been years since we played with only cards from that set. We all prefer the added variety of playing with cards from 2-3 sets. If you start with Dominion: Big Box, you’ll already have Dominion, Prosperity, and Alchemy, as well as 2 promotional Kingdom cards. That’s enough variety to last a good, long while. Concluding Thoughts: Is Dominion Fun? This is where I make a confession: Dominion is not my favorite game. It’s not even among my favorite 20 games. As a life-long gaming enthusiast, I have other games I would play if given a set of other enthusiastic gamers at the table willing to play anything I want. Though I usually enjoy it, sometimes I don’t. For me, it depends on the Kingdom set. Some of them have an obvious superior strategy and are therefore dull, though thankfully never more than 30 minutes of dull. However, when the optimal strategy for a given Kingdom set isn’t obvious and many strategies seem possible, all of us tend to have a lot of fun seeing which of our competing strategies prevails. We sometimes play a particularly interesting Kingdom set a few times to continue trying out different paths to victory. Most games are in between these two extremes, and that’s when you see how much each of us really likes this game. I like Dominion well enough to want to play, though sometimes it’s a matter of looking forward to the end of the current game in order to get to the next (likely better one). My 11-year-old son likes it more. He especially delights in stringing together lots of Actions. My wife likes it best, as she tends to find all but the dullest of dull Kingdom sets to be a fascinating puzzle for not just forming a pregame strategy, but also for making tactical decisions during the game. Simply try buying Kingdom cards without much of a plan and see what happens. This is how I notice typical families enjoy this game. Forget all that deep strategy—just buy Kingdom cards and see what happens! Dominion is one of very few strategic games we have that can be played in 30 minutes or less, which means it’s often on the short list when we don’t have much time. Even though it’s not among my favorite few games, this is one of the few games we agree to play frequently. Among deckbuilding games, I much prefer Magic the Gathering. I even wrote about how to play Magic inexpensively. But my son’s interest in Magic goes up and down, while my wife doesn’t like the complexity of so many mechanics, cards, and deck-building choices. So Dominion it is—a compromise that works for the entire family. It’s fun to play, sufficiently challenging, appealing to all of us despite our different preferences, and typically takes under 30 minutes to play. That works. Previous Previous post: Can You Teach Hustle in Youth Baseball? Yes!